1 G. MARSHALL 1, 2, O. Voznyy 1, X. DING 1, D. LEPAGE 1, J.J. DUBOWSKI 1, 3 1 Département de Génie Électrique et de Génie Informatique, Université de Sherbrooke, Sherbrooke, Québec, 2 Institute for Chemical Process and Environmental Technology, National Research Council of Canada, Ottawa, Ontario 3 Canada Research Chair in Quantum Semiconductors GaAs-Molecular Interface for Quantum Semiconductor Biosensors Motivation: Need to develop optical biosensor for rapid and simultaneous detection (< 15 min) of different pathogenic substances at the point of care RQMP annual meeting, Montreal, May 14, 2007 Samples Recipe IRecipe II GaAsGaAs-TGaAsGaAs-T I0I0 13.0234.4915.9643.56 A33.9885.0661.48120.95 1 (hours) 293.5569.26226.47587.37 I 0 +A47119.5577.44164.51 Surface Etching and Thiolation Recipes Recipe IRecipe II Surface Etching37% HCl, 1minNH 3.H 2 O/H 2 O; HCl/ethanol, no ambient exposure Thiol Deposition55 o C, with 5% NH 3.H 2 O, N 2 Room temperature, no NH 3.H 2 O GaAs passivated with T16 using recipe II shows higher PL signal and slower PL decay dynamics, therefore more stable interface. Nanocrystals and various nanoparticles interfaced with biological materials are thought to have potential as novel luminescent probes for both diagnostics (e.g., imaging) and therapeutic (e.g., drug delivery) applications because of their comparable size to biomolecules and attractive optical, electrical and magnetic properties. 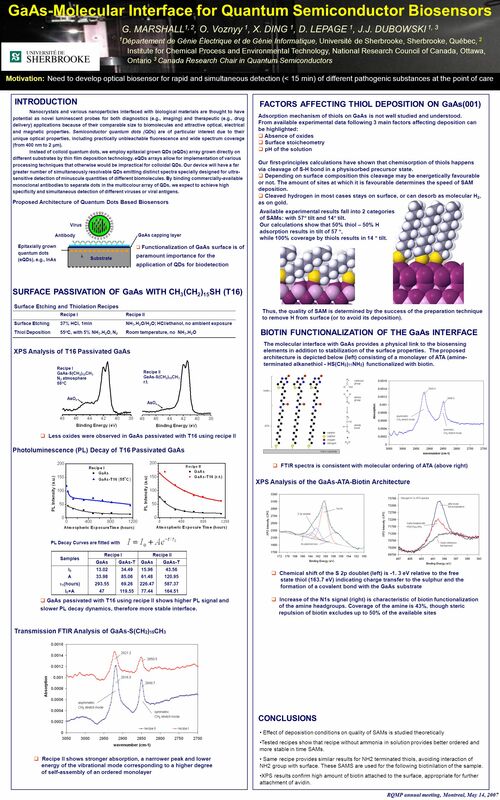 Semiconductor quantum dots (QDs) are of particular interest due to their unique optical properties, including practically unbleachable fluorescence and wide spectrum coverage (from 400 nm to 2 μm). Instead of colloid quantum dots, we employ epitaxial grown QDs (eQDs) array grown directly on different substrates by thin film deposition technology. eQDs arrays allow for implementation of various processing techniques that otherwise would be impractical for colloidal QDs. Our device will have a far greater number of simultaneously resolvable QDs emitting distinct spectra specially designed for ultra- sensitive detection of minuscule quantities of different biomolecules. By binding commercially-available monoclonal antibodies to separate dots in the multicolour array of QDs, we expect to achieve high specificity and simultaneous detection of different viruses or viral antigens. Less oxides were observed in GaAs passivated with T16 using recipe II AsO x Recipe I GaAs-S(CH 2 ) 15 CH 3 N 2 atmosphere 55 o C Recipe II GaAs-S(CH 2 ) 15 CH 3 r.t. INTRODUCTION Proposed Architecture of Quantum Dots Based Biosensors Functionalization of GaAs surface is of paramount importance for the application of QDs for biodetection Substrate Epitaxially grown quantum dots (eQDs), e.g., InAs Virus Antibody GaAs capping layer SURFACE PASSIVATION OF GaAs WITH CH 3 (CH 2 ) 15 SH (T16) XPS Analysis of T16 Passivated GaAs Photoluminescence (PL) Decay of T16 Passivated GaAs PL Decay Curves are fitted with Transmission FTIR Analysis of GaAs-S(CH 2 ) 15 CH 3 Recipe II shows stronger absorption, a narrower peak and lower energy of the vibrational mode corresponding to a higher degree of self-assembly of an ordered monolayer BIOTIN FUNCTIONALIZATION OF THE GaAs INTERFACE XPS Analysis of the GaAs-ATA-Biotin Architecture Chemical shift of the S 2p doublet (left) is -1. 3 eV relative to the free state thiol (163.7 eV) indicating charge transfer to the sulphur and the formation of a covalent bond with the GaAs substrate Increase of the N1s signal (right) is characteristic of biotin functionalization of the amine headgroups. Coverage of the amine is 43%, though steric repulsion of biotin excludes up to 50% of the available sites The molecular interface with GaAs provides a physical link to the biosensing elements in addition to stabilization of the surface properties. The proposed architecture is depicted below (left) consisting of a monolayer of ATA (amine- terminated alkanethiol - HS(CH 2 ) 11 NH 2 ) functionalized with biotin. FTIR spectra is consistent with molecular ordering of ATA (above right) CONCLUSIONS Effect of deposistion conditions on quality of SAMs is studied theoretically Tested recipes show that recipe without ammonia in solution provides better ordered and more stable in time SAMs. Same recipe provides similar results for NH2 terminated thiols, avoiding interaction of NH2 group with surface. These SAMS are used for the following biotinilation of the sample. XPS results confirm high amount of biotin attached to the surface, appropriate for further attachment of avidin. FACTORS AFFECTING THIOL DEPOSITION ON GaAs(001) Adsorption mechanism of thiols on GaAs is not well studied and understood. From available experimental data following 3 main factors affecting deposition can be highlighted: Absence of oxides Surface stoicheometry pH of the solution Our first-principles calculations have shown that chemisorption of thiols happens via cleavage of S-H bond in a physisorbed precursor state. Depending on surface composition this cleavage may be energetically favourable or not. The amount of sites at which it is favourable determines the speed of SAM deposition. Cleaved hydrogen in most cases stays on surface, or can desorb as molecular H 2, as on gold. Thus, the quality of SAM is determined by the success of the preparation technique to remove H from surface (or to avoid its deposition). Available experimental results fall into 2 categories of SAMs: with 57 tilt and 14 tilt. Our calculations show that 50% thiol – 50% H adsorption results in tilt of 57, while 100% coverage by thiols results in 14 tilt. Télécharger ppt "G. MARSHALL 1, 2, O. Voznyy 1, X. DING 1, D. LEPAGE 1, J.J. DUBOWSKI 1, 3 1 Département de Génie Électrique et de Génie Informatique, Université de Sherbrooke,"
Low influenza A(H1N1)2009 population and high risk group vaccination coverage during the pandemic, France ESCAIDE Lisbon, November 2010. By Russell Sheldrake, Linus Calvert and Matt Kerry. Chez nous 6 6 UNITÉ Quit Cest quelquun que tu connais 22 LEÇON B Révision: Le passé composé p. 331 A Le verbe vivre p. 330 C Le pronom relatif qui p. 332.